An article by the incredible Dr. Axe. Stress is a part of everyday life. Without it we would never get off the couch, never worry about our work efforts, what our kids are up to, never put out the fire or avoid the car that veers into our lane! The degree of stress that we encounter on a constant basis in modern society, however, has reached epidemic proportions. I love the quote above, because we often do fall into the trap of stressing out and just generally driving ourselves crazy. But it’s important to remember that stress triggers the “fight-or-flight” response. The surge of adrenaline and the slowing down of other basic functions provide us with the instant energy we need to run from a predator or battle an attacker. This survival response comes with side effects though. Over time, that extra energy and alertness comes with altered hormone levels, heightened blood sugar, depleted nutrients and lowered neurotransmitters. Over time, our bodies adapt to invoke that same response with smaller and smaller triggers. “Fight or flight” is the normal operating mode for many of us, rather than the true emergency survival mechanism it was meant to be. We rarely work off that energy, take restorative actions or release ourselves from that state of mind. Chronic stress affects every bodily system. It suppresses the immune system, slows metabolism and cell regeneration, makes airways reactive, and creates muscle tension. It is estimated that 90 percent of doctor visits can be traced back to stress. 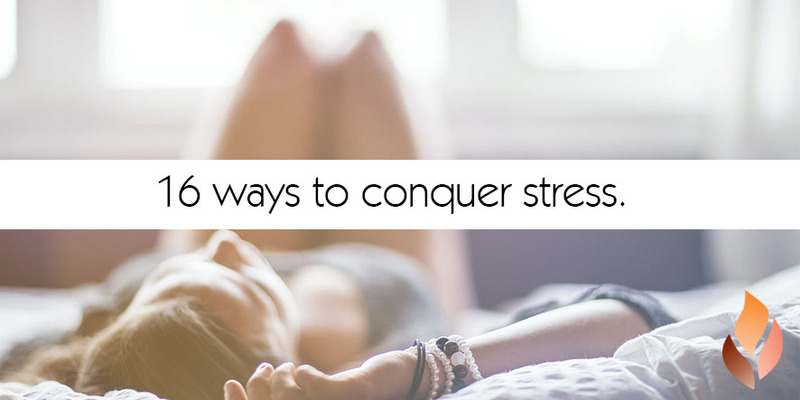 Stress can be linked to weight gain, heart disease and depression. It increases the risk of diabetes, hypertension, arthritis and osteoporosis. Stress impairs cognitive function over time, reducing creativity, memory and problem-solving skills. Headaches, sexual dysfunction, irritability, problems sleeping and addictive behaviors are often stress-related. The degree of stress we experience on a daily basis might be a cultural norm, but personal priorities, personal choices and our purposeful reactions to stress can limit the negative health effects of stress. Pick a few of these suggestions below to reduce stress in your life and promote health and healing in your body. Spiritual triathlon. This is my personal method for keeping my focus throughout the day. Every morning when I wake up, I spend five minutes saying all that I am grateful for, five minutes in healing prayer, and five minutes reading my Bible or something inspirational. Schedule relaxation. Write it down in your planner, and stick to it. Make time at least once a week to do something you love — something that refreshes you. Maybe that’s a game of tennis, spending an hour alone with a good book or taking a yoga class. Pour yourself a cup. Many varieties of hot tea have calming effects on the body and can help lower blood pressure. Try green or black tea or herbal teas with chamomile. Take a deep breath. Try deep breathing for a few minutes every day. Tighten and release muscles. Hum to release nitric oxide and improve blood pressure. Just say “no.” I promise it’s OK! Don’t spread yourself too thin or you won’t be able to give 100 percent of your efforts to any of the tasks you attempt. Your value does not depend upon how much you do for others at the expense of your own time, relationships and health. Expel excess adrenaline. Before, during and after stressful situations, walk briskly for five minutes, run up a flight of stairs, do backward pushups on your chair or do five minutes of deep breathing. A short burst of physical activity can expel anxiety and give you clarity and calm. Nix the caffeine, nicotine and alcohol. Don’t add to nervous energy with stimulants, and don’t mask stress with alcohol. The long-term effects compound the negative effects of stress. Exercise regularly. Regular exercise helps expel built-up tension, stress hormones and clears the mind. Exercise helps to release endorphins, the brain’s natural feel-good chemicals. I recommend burst training for the most health benefits. Sleep. Staying up late to get more done robs you of your total productivity. It dulls your mind, increases stress, promotes weight gain and contributes to mood swings. Connect with others. Making time for social connection is very important and restorative. Social connection is what makes us a part of something larger than ourselves and our worries. It gives us perspective. Be prepared. You can combat alarmist or catastrophic thinking by being prepared. Keep a change of clothes in the car, create an emergency fund for car repairs and have an alternative proposal in mind at work. Share responsibility. Delegating really is an important skill. Instead of complaining about how much you have to accomplish, teach your kids to cook, share the credit with a co-worker or work out sports shuttling with another parent.